Amp Up The Effects Of Your Skincare Products With These 6 Tips! Home » Anti Aging Beauty Blog » Amp Up The Effects Of Your Skincare Products With These 6 Tips! Make the skincare products you use do their magic on your facial skin EVERY TIME YOU APPLY THEM with these 6 simple tricks from a well-known New York dermatologist. Be a facial cleansing pro. If you think that there’s no special way to apply your cleanser, then you’re wrong. The NY skin doctor stressed out the need to concentrate your cleansing product on the area with the most pores. A cleanser effectively strips off gook from your facial skin without leaving it dry or giving you that “stripped off” feeling, thanks to the many natural ingredients and antioxidants it contains like leaf extracts from Green and White Tea as well as coco-glucoside, a derivative from coconut oil and glucose. Put on serum right after cleansing while your skin’s still damp. The reason for this is once the water evaporates from your skin, it takes off with it whatever moisture there is on and below the epidermis leaving it dry. “I always advice my clients to put on moisturizers and serums while the skin’s a little wet. Doing so locks in moisture making the skin more supple,” she said. And for those who don’t like to wash their faces in the morning, dampening the skin before starting your morning skincare routine will do. As what its name signifies, this serum is rich in vitamin C, a very crucial nutrient for collagen production and skin health. Aside from the above-mentioned nutrient, it also contains vitamin E which is essential for skin hydration and vitamin B5, an important component in fighting skin aging. Layer It And Layer It Rightly. The skin doctor stated that if you want a healthy and glowing complexion, don’t skip and scrimp on your serums. “Serums have it all – anti-aging, skin hydration, repair, the solution to hyperpigmentation, and formulated with a lot of antioxidants,” she added. Her beauty advice: don’t be afraid of layering skincare products that do so in the right way. 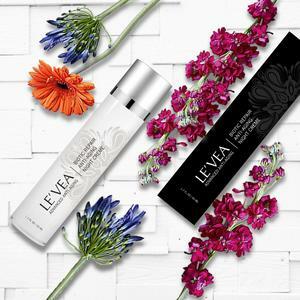 The skin doctor from New York had this to say when it came to toners: “The more natural ingredients it contains, the better.” Le’vea’s hydrating toner passes that test. Aside from the natural plant extracts it contains, it’s also formulated with vitamins C and B5 as well as Hyaluronic Acid. Exfoliate twice or thrice a week. - the dead skin cells on our epidermis make our facial skin lose its radiance. This makes our faces look dull. Exfoliating will strip off this layer, uncovering the younger, more radiant skin underneath. - the layer of dead skin cells on our epidermic layer also bars the skincare products we use from penetrating to our skin and working their magic. Your daytime and nighttime skincare routines should differ from each other. Why shouldn’t your morning and nighttime skincare regimens be different? “Your morning routine should be geared towards skin protection. Your nighttime regimen, on the other hand, should focus more on skin repair,” the doctor clarified. This product is your skin’s ideal helper as it repairs itself while you sleep. This night cream is guaranteed to reverse the cell damages your day has brought on you as well as provide your skin with ample hydration to avoid overnight skin dry out. Use the dot method when putting on sunscreen instead of just slathering the product on your skin. We shouldn’t use the slap-and-dash method when putting on sunscreen. After all, our skin’s protection from the harmful rays of the sun relies on how we apply this product. To get optimal results from your sunscreen, use the dot method. I hope these 6 tips help you get the most out of the skincare products you use!